None of the work we do at our church would be possible without God moving the hearts of our people to give. Your generosity helps create a church where people feel welcome, led, and loved—a place where life-changing stories are being written. Thank you for giving from your heart. Each donation allows us to continue to do what God has called us to do, both in our local community and in our world. Below you can make a one-time donation or set up a recurring donation. You can personally manage and update your giving by creating a PushPay Account. We want to make it as convenient as possible for you to make a donation. 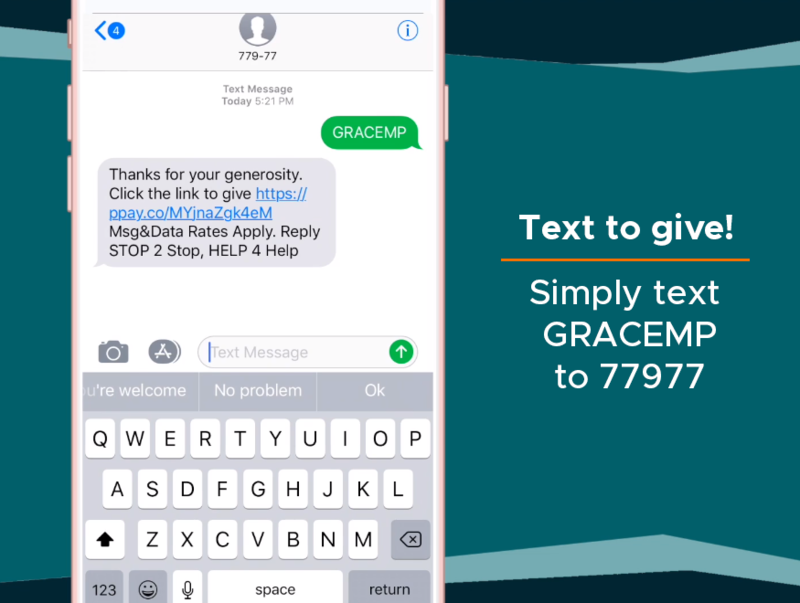 The online giving platform allows you to set up your account in just a few easy steps by visiting our website or by texting us. If you need assistance setting up an account or have any questions, please contact Jason Tubbs. You do not need to create an account to give. To make your future donations even faster, you can create an account during checkout. We encourage those who consider Grace Church their spiritual home to tithe. Tithing (giving 10% of gross income) is a sacrificial effort on our part that expresses gratitude towards an all-loving God. In January 2018 we started the final phase of renovations at our Mission Street location which includes raising the roof and remodeling the main auditorium space. We have raised more than half of our $500,000 goal, but we are counting on generous giving to cover the cost of this project. We believe that the Lord will provide the resources needed to finish this work through His people. In 2018 and beyond, Grace Church’s commitment to a longer-term presence in Myanmar will allow us to assist and establish vibrant communities of faith in this precious land. It is our desire that additional families and individuals will be sent to further the initial pioneering efforts of the Flanders. Our hope is that the Twelve17 Coffee Roaster’s ministry will be able to secure a permanent station in Myanmar for receiving and training both Burmese nationals and expats visiting short-term. In an effort to both encourage and inform our church family, our monthly and yearly income and expense summaries are available upon request. We hope this information will remind us to thank God for the resources He is currently providing through His people, show the specific ways that donations to Grace Church are being used to further the Lord’s work through this church body, and encourage God’s people to give generously and joyfully. If you have any questions about giving to Grace or need assistance setting up a donation, please email finances@gracemp.org or call 989.775.7101 ext. 101.